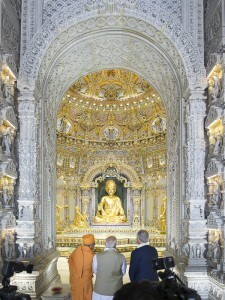 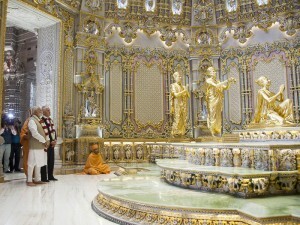 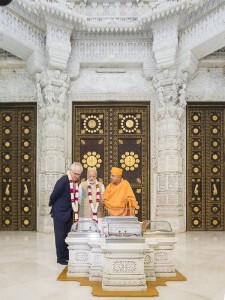 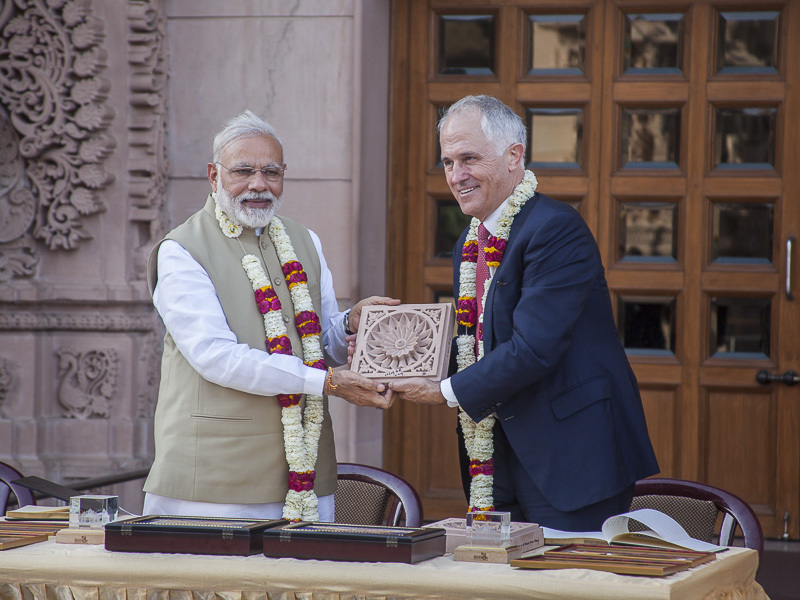 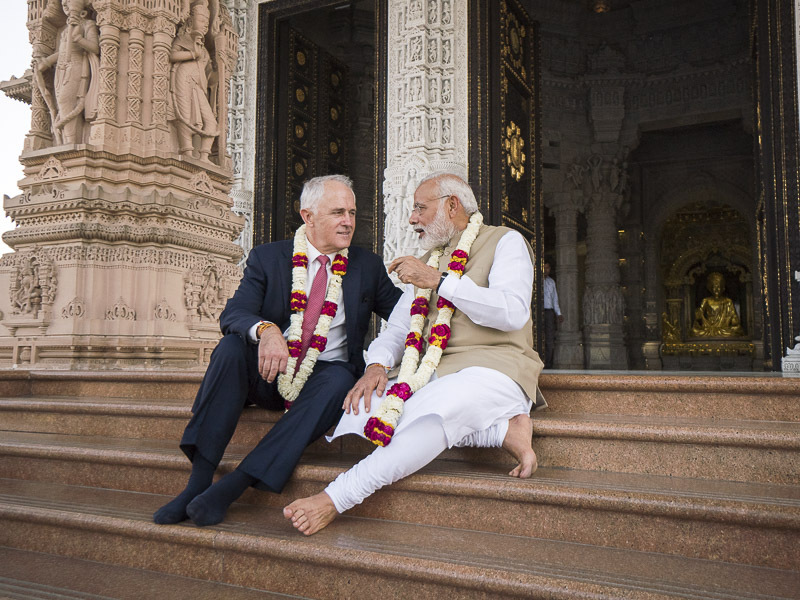 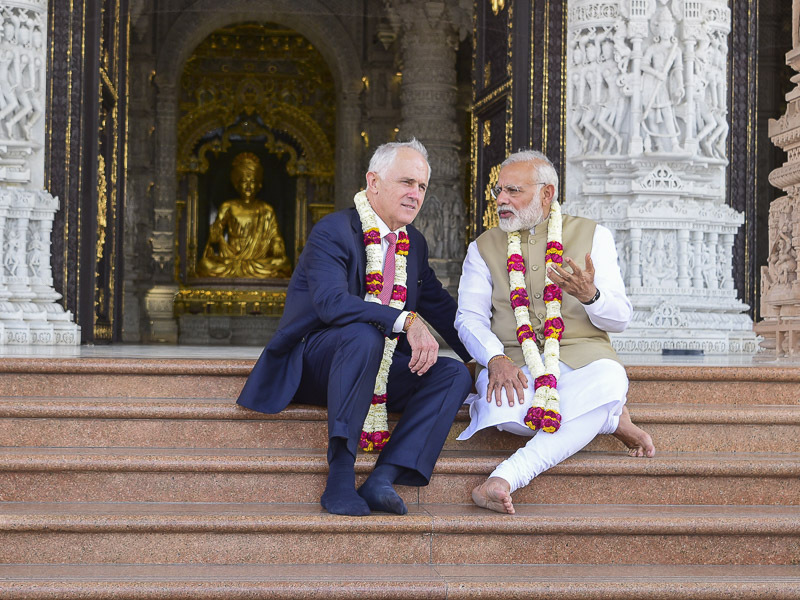 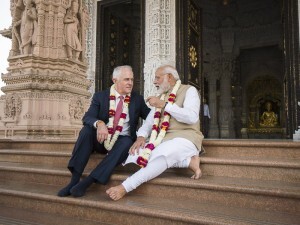 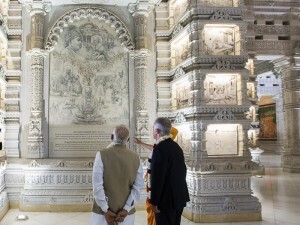 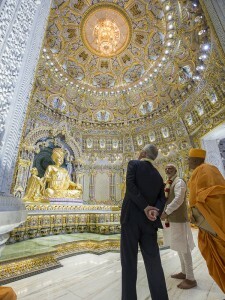 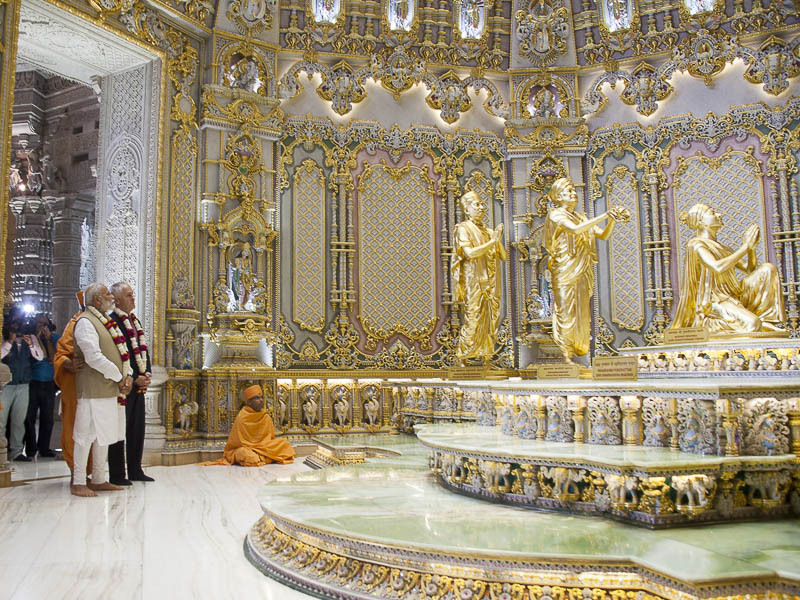 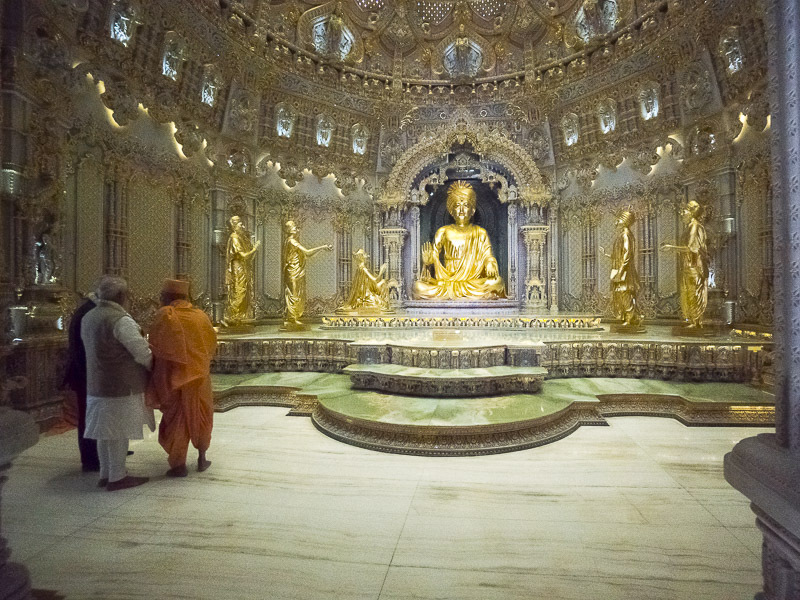 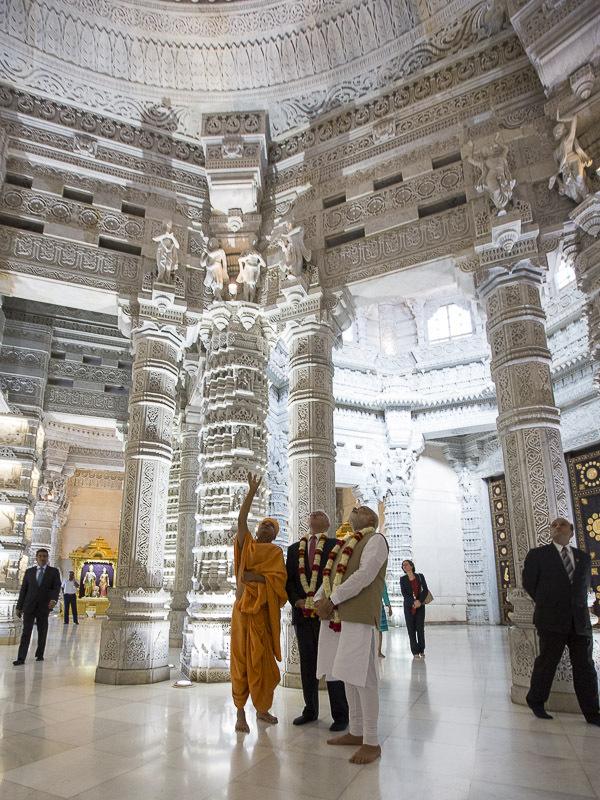 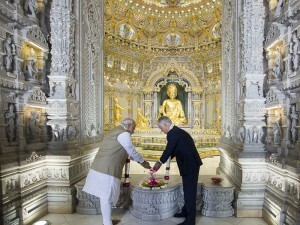 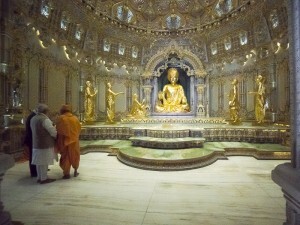 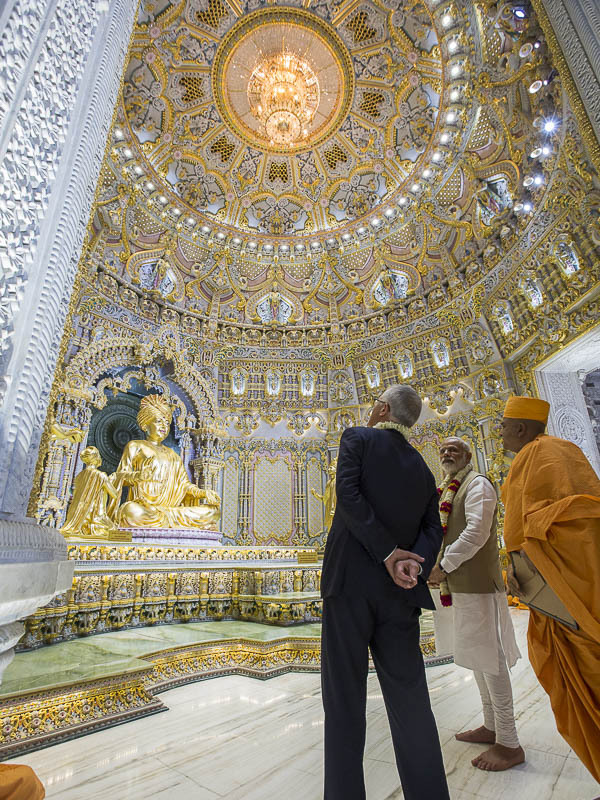 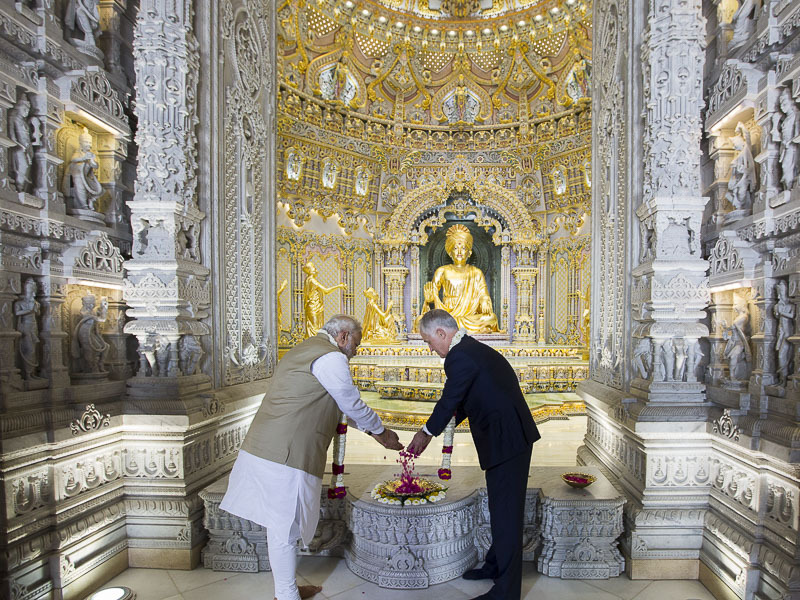 On Monday, 10 April 2017, the Prime Minister of India Narendra Modi took the visiting Prime Minister of Australia Malcolm Turnbull to see the Swaminarayan Akshardham in New Delhi. 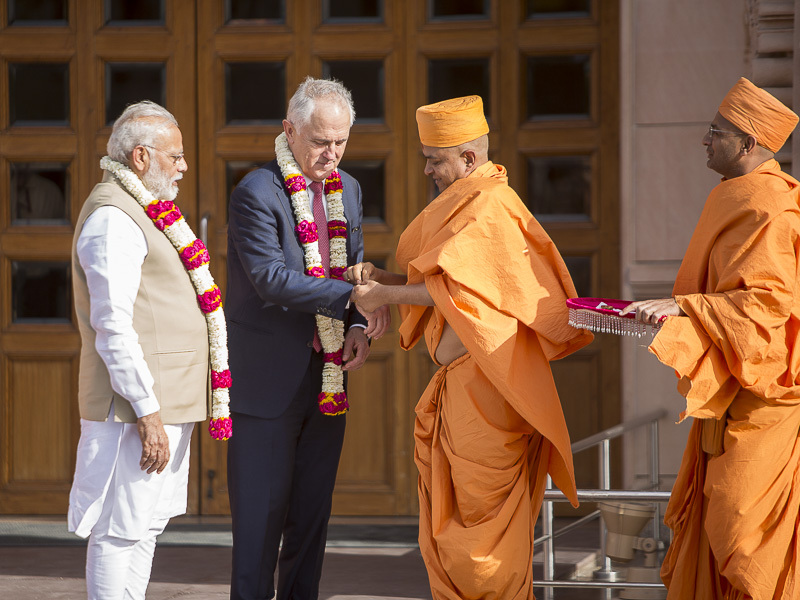 On behalf of His Holiness Mahant Swami Maharaj – Spiritual Head of Swaminarayan Akshardham and BAPS Swaminarayan Sanstha – senior sadhus traditionally welcomed the leaders of Australia and India at the Mayur Dwar (Peacock Gate) with a garland of flowers and by tying the sacred kalva (sacred thread) on their wrists. 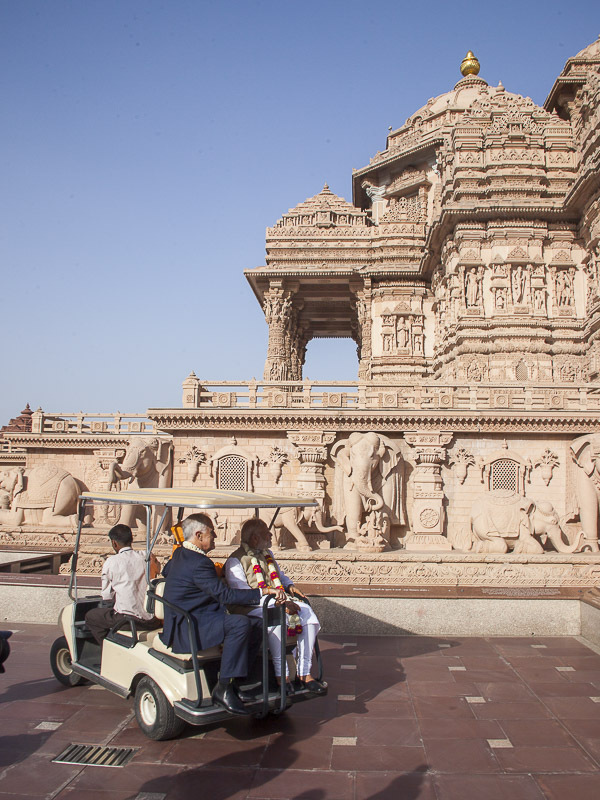 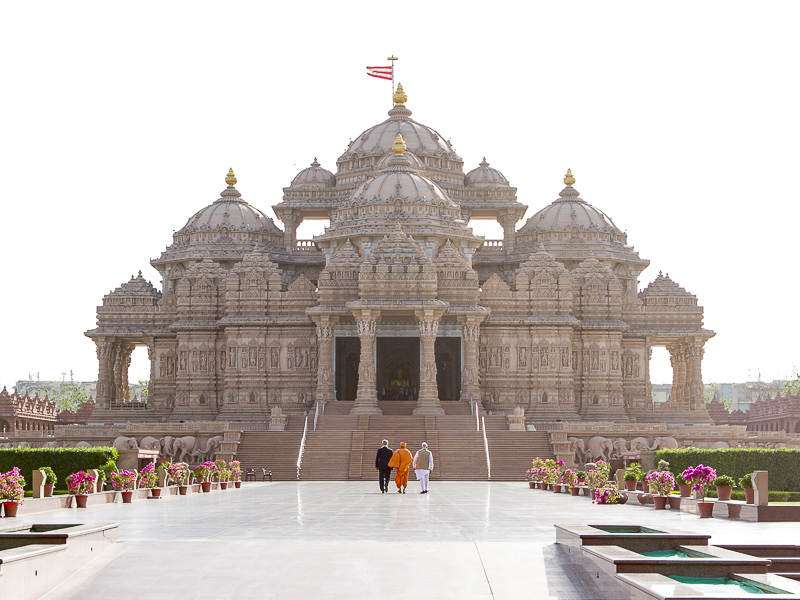 Both dignitaries first visited the Swaminarayan Akshardham Mandir, where they paid respects to Bhagwan Swaminarayan by offering flowers and admired the Mandir’s art and architecture. 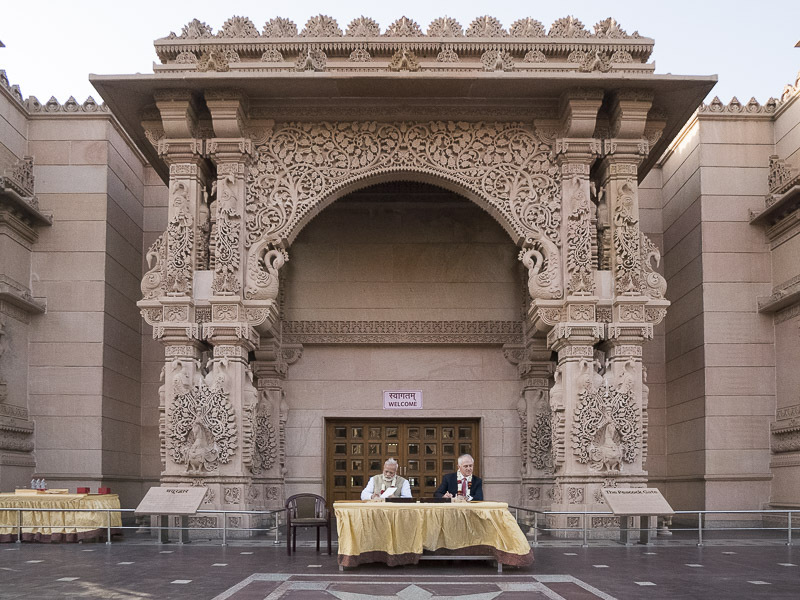 They also learned how His Holiness Pramukh Swami Maharaj had inspired thousands of volunteers and artisans to create the mandir to share the message of love, peace, tolerance, non-violence, co-existence and global harmony. 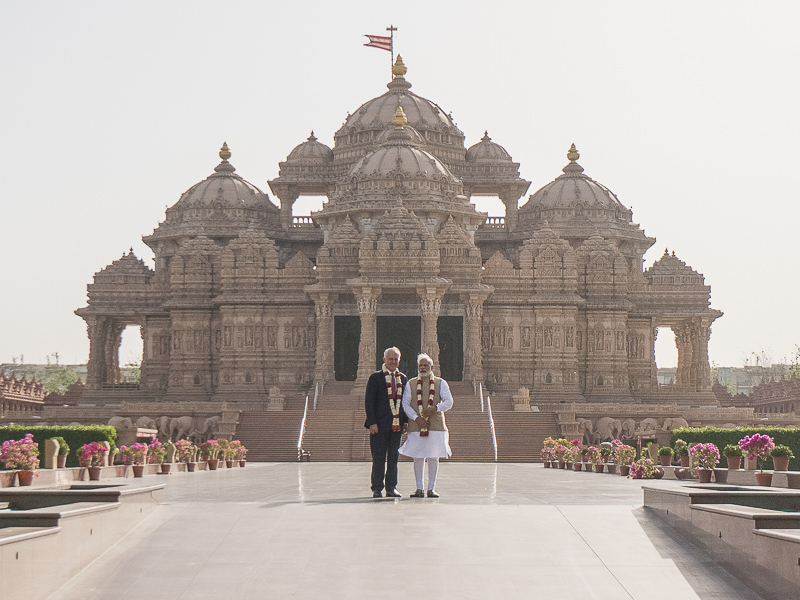 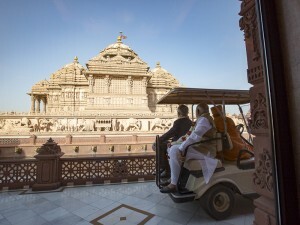 Sitting on the steps of the Akshardham Mandir, both leaders experienced the Mandir’s serenity and peaceful vibrations. 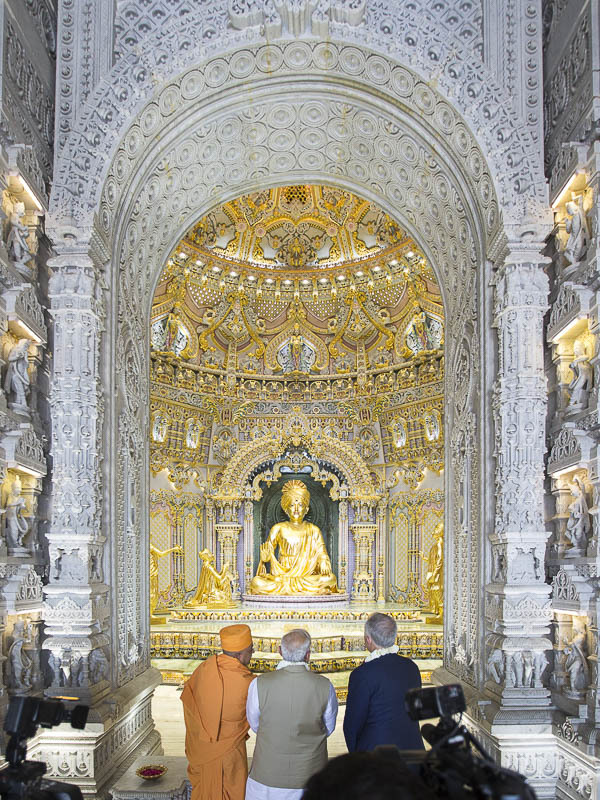 They discussed how Swaminarayan Akshardham is a modern-day wonder created by the synergy of tradition, technology, science, and spirituality. They resolved to promote world peace and prosperity, and strengthen relations between India and Australia. The prime ministers marveled at the Gajendra Pithika (Elephant Plinth), admiring the 148 life-sized carved stone elephants depicting message of social harmony, peace and spirituality. 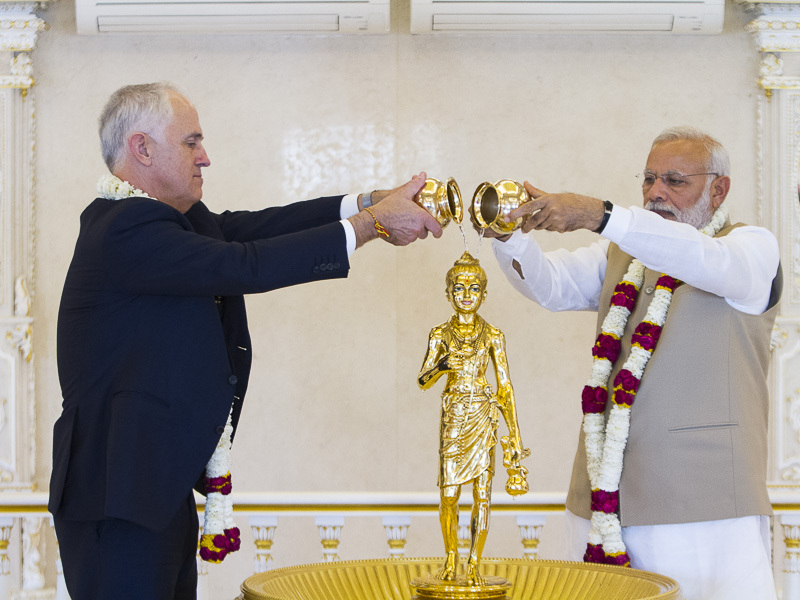 They offered prayers for world peace and harmony by offering ‘abhishek’, the ceremonial pouring of sanctified water from 151 holy rivers, lakes and ponds across India, on the sacred image of Shri Neelkanth Varni. 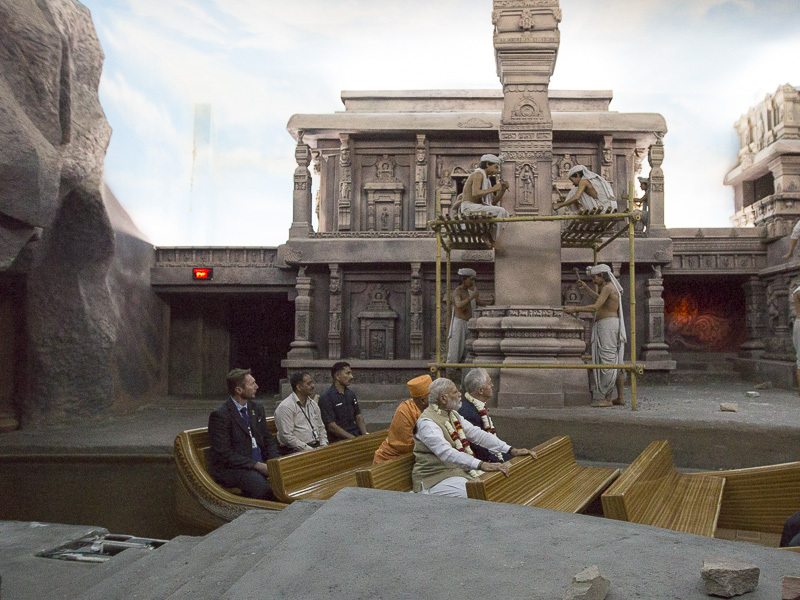 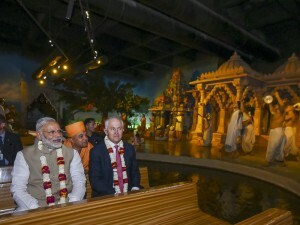 Both prime ministers then experienced the Sanskruti Vihar boat ride exhibition – a cultural voyage that sails through 10,000 years of India’s glorious heritage, highlighting India’s contributions to humanity through the ages. 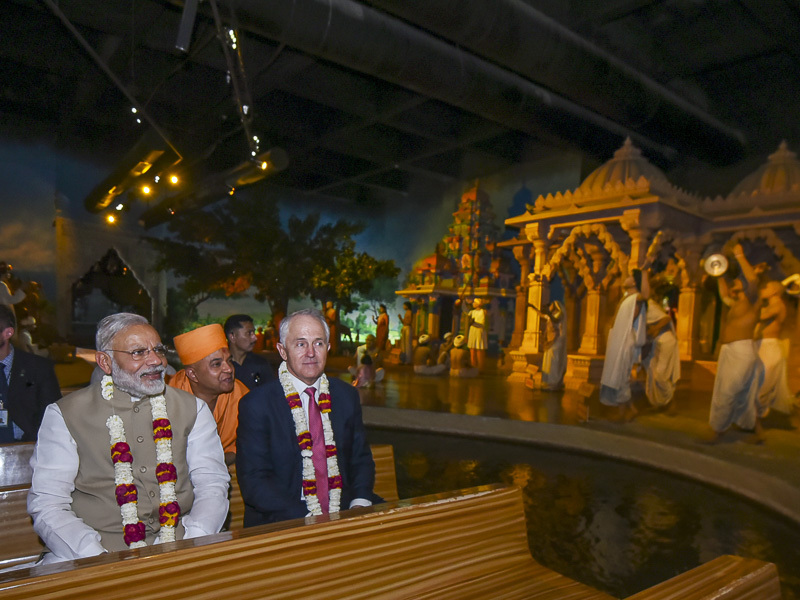 Prime Minister Turnbull was fascinated by the cultural history and contributions of India depicted in the boat ride exhibition. Before the two prime ministers departed, they were presented with special mementos of their visit.